A study aiming to discover why American Mink, an invasive species, choose to settle in areas where they do and therefore discover ways to more effectively prevent their spread, was published today in the Journal of Applied Ecology. Scientists at the University of Aberdeen have made a new discovery that could help in the fight against a fungus that kills around 200,000 people every year and causes lung and allergic diseases in millions of others. Record-breaking cyclist Mark Beaumont joined University of Aberdeen staff this morning to give them tips on tackling Scotland's equivalent of Route 66 to raise awareness and funds for a new specialist cancer team. Leading academics from the University of Aberdeen are among 66 distinguished individuals who have been elected to become Fellows of the Royal Society of Edinburgh (RSE). Maggie Chapman has been re-elected by students as Rector of the University of Aberdeen. Students at the University of Aberdeen may have noticed two friendly, if a little furry, faces around Old Aberdeen recently. The University of Aberdeen was presented with the Queen's Anniversary Prize for Higher and Further Education at a ceremony in Buckingham Palace. A new half million pound microscope capable of looking at objects only slightly bigger than an atom has been officially unveiled at the University of Aberdeen. The University of Aberdeen has launched its first 'in-country' pre-medical qualification in Sri Lanka, where students will be able to obtain a pre-medical award studying in the nation's largest city, Colombo. A former Spanish junior rowing champion has swapped sunny climes for Aberdeen's River Dee to compete in one of Scotland's most hotly-contested rowing events. A fun-packed show for children will mark the start of Chinese New Year celebrations at the University of Aberdeen, which this year is expected to attract close to 1000 visitors. Medication routinely prescribed for common complaints including allergies, heart disease and Parkinson's has been linked to an increased risk of stroke according to new research from the University of Aberdeen. Scientists have discovered crucial new information about how a foetus develops which could explain why very premature babies suffer low blood pressure and other health problems. The components of a controversial drug, allegedly linked to birth defects in the 1960s and '70s, caused deformations to fish embryos just hours after they received a dose in new studies by researchers at the University of Aberdeen. Following months of trials and tests, the final crews have been for the 23rd annual Aberdeen Boat Race, which takes place on Saturday, March 17. The University of Aberdeen, Aberdeen City Council and the Gaelic parent group Comann nam Pàrant have joined forces in order to provide Gaelic speaking school pupils with the opportunity to carry out an activity based award scheme - translated into Gaelic. This week the University of Aberdeen and Aberdeen University Student Association (AUSA) signed a statement of commitment to address sexual violence and harassment on campus. Researchers at the University of Aberdeen have been named within an important partnership which will receive a portion of a £54 million research fund focussed on using data science to address challenging healthcare issues. 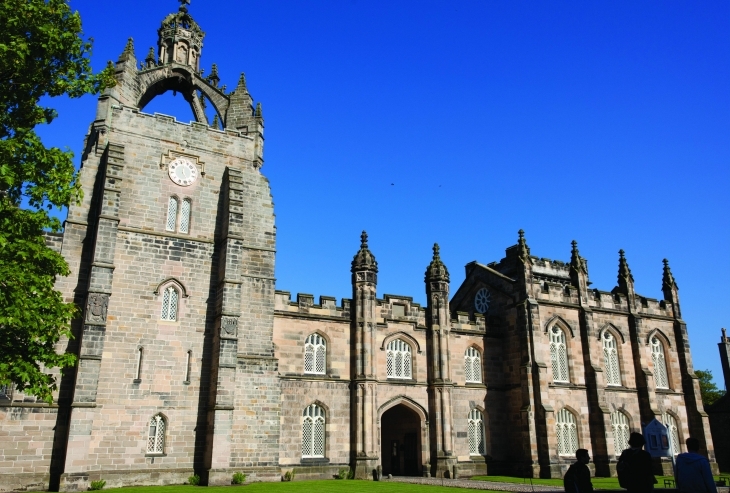 The Scottish finals of an international competition for law students from around the world will take place at the University of Aberdeen next week. A renowned theologian is set to deliver a series of lectures that will propose a re-examination of history to help us better understand the nature of Christianity and its mission in the modern world. A leading economist has been appointed Jaffrey Chair of Political Economy at the University of Aberdeen Business School, becoming only the sixth person to hold the prestigious role since it was established nearly a century ago.